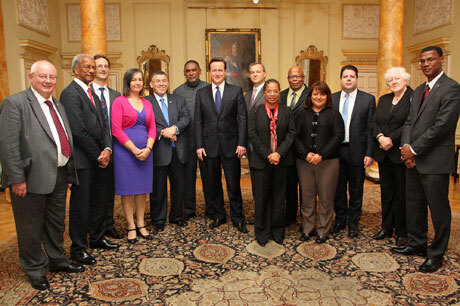 Chris Bates, Tristan's UK Representative, attended the Joint Ministerial Council of the UK Overseas Territoriesat 10, Downing St in December 2012.
when they met in 10, Downing Street on 5th December. The urgency of rebuilding or replacing both Tristan's harbour breakwater and the Camogli Hospital were discussed at the first Overseas Territories Joint Ministerial Council in December at Lancaster House in London. And in an unprecedented move, the island's UK Representative was able to discuss these priorities with Prime Minister David Cameron in No. 10 Downing Street, at the conclusion of the Council. The meeting of political leaders from the UK's Overseas Territories replaced the Overseas Territories Consultative Council, which Tristan's Chief Islanders have attended on alternate years (cost, distance and travelling time precluding annual participation). UK Representative Chris Bates put Tristan's points of view in the Council, which was chaired by the recently appointed Minister for Overseas Territories, Mark Simmonds MP and a number of other UK Government Ministers. He said: “Priorities and background papers had been prepared with the other territories in conjunction with the Foreign and Commonwealth Office, so that all participants were as well briefed as possible. The urgency of rebuilding or replacing the harbour breakwater and the need to progress the renovation or renewal of Camogli Hospital – and ideally creating a pool of doctors to serve Tristan – were high on the agenda. I was pleased with the response to all the points which Tristan wanted raising with Ministers, officials and delegates. “The Prime Minister was brought up to date on the questions of the harbour and the hospital and he clearly understands the islanders' concerns”. He added: “I pointed out that Tristan is not on budgetary aid and has made great progress after overcoming and carrying through some tough decisions, in surmounting some of the difficulties which have beset it in recent years, but there are matters on which decisions must be taken to enable the community to survive and thrive”. In the Council's discussion on Building Successful and Resilient Economies, delegates were told this was interlinked with relations with the EU, in view of Tristan's continuing negotiations to gain access for its lobster product to EU markets. Investment in education (so that islanders could compete as equals with the outside world in sustaining and developing their economy and administration) is essential. So too was development of the harbour to stabilise or renew it, without which it would be difficult to persuade potential business partners, especially the cruise ship industry, to do business with the island, because of unpredictable lines of communication and the lack of any planned regular communication with St. Helena, once that island's airport is opened. “ The grounding of a bulk carrier in March 2011 illustrated graphically just how fragile our biodiversity is and it could be many years before we know the true extent the oil and cargo spill will have had on the marine environment. Not only did this terrible accident have an impact on the penguin population but it also threatened the lobster fishery, the backbone to the Tristan economy and therefore the sustainability of an entire community. “The Tristan community appreciates just how important their biodiversity is and their response to this disaster was recognised by the RSPB who this year awarded the entire community the RSPB medal. “ Over the last few years the Tristan government has, with the help of its many friends in the conservation world, taken great steps to put biodiversity issues further up the agenda. Some tangible examples include; forming a standalone conservation department that has taken forward projects sponsored under the Darwin initiative, OTEP and JNCC. It now carries out annual monitoring of sea birds on Nightingale and Tristan and has produced management plans for the World Heritage sites of Inaccessible and Gough. In 2011, the Tristan fishery was awarded MSC (Marine Stewardship Council) accreditation, demonstrating that we have a well managed and sustainable fishery. A comprehensive Biodiversity Action Plan has just been agreed. “None of this could have been possible without the dedication of the Tristan community which has worked closely with a number of partners over the last few years including; RSPB, JNCC, OTEP, Mohammed Bin Zayed, T-Bag, our fishing concessionaire Ovenstone and a number of individuals”. From the session Building Stronger and Healthier Communities attended by Hugh Robertson MP, Minister for Sport and Tourism at the Department for Culture, Media and Sport, it emerged that although organisations in territories such as Tristan cannot apply for lottery funding, organisations in the UK wishing to fund something in a territory can do so. In the Council, Chris Bates had pointed out the very limited sporting facilities on Tristan and lack of equipment – which in turn could have an impact on future health in the community – and explored whether Mr Robertson's department might be able to offer some ideas and contacts. Chris said: “Tristan was greatly helped throughout by the presence of the Governor, Mark Capes and by the St. Helena Representative, Cllr Derek Thomas, who kindly agreed to give the Minister a letter explaining Tristan's priorities, as in the absence of the Chief Islander, Tristan did not have a bilateral meeting with him. The St. Helena UK Representative, Kedell Worboys and the Ascension Island delegate, Cllr. Cathy Cranfield were especially helpful – together, I thought we made an effective team putting the case of our islands in a constructive and forthright way”.